Heat oven to 375°F. Grease 11x7-inch (2-quart) glass baking dish. In large bowl, stir together macaroni, spinach and mushrooms; spread in dish. In large bowl, beat remaining ingredients except Cheddar cheese with wire whisk or hand beater about 1 minute or until almost smooth; stir in Cheddar cheese. Pour over spinach mixture. Bake uncovered 40 to 45 minutes or until golden brown. Dinner is served! 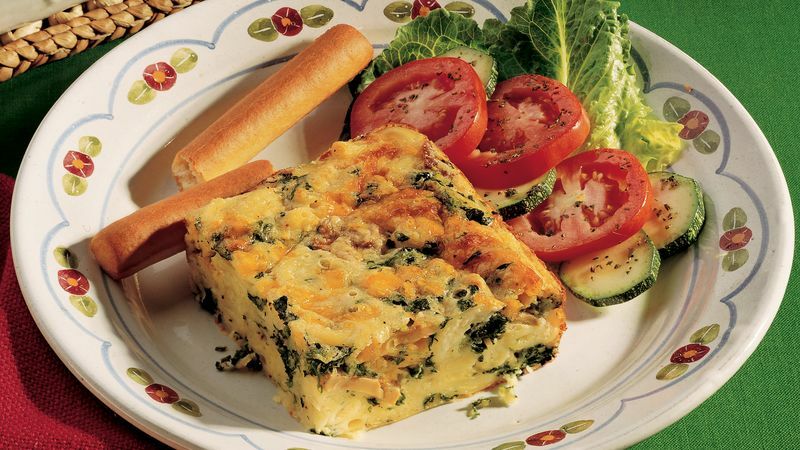 Enjoy this hearty bake with a tossed green salad. If you’d rather use regular eggs but want to reduce the cholesterol, use 2 whole eggs and 4 egg whites instead of the fat-free egg product.